Walkable, pedestrian infrastructure is a key element of a “Complete Community.” Walkable communities encourage pedestrian activity, expand transportation options, and have safe and inviting pedestrian infrastructure is accessible and serves people of all ages and abilities. When sidewalks, parks, and trails are pleasant to walk, all community members benefit. Unfortunately, not all places are walkable, but there are plenty of tools citizens and municipalities can utilize to achieve positive changes. This video highlights the needs for walkable communities in Delaware. Walkability impacts nearly every facet of community life. Therefore, it is vitally important for citizens to understand the benefits of walkable pedestrian infrastructure, recognize where barriers exist, and work collaboratively with other stakeholders to make positive changes to a community’s walkable infrastructure. 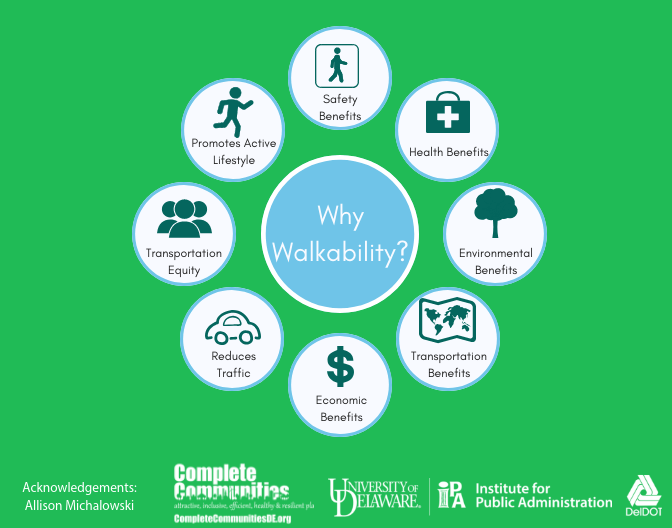 Delaware’s state agencies, local governments, metropolitan planning organizations, and advocacy groups have been working to make Delaware more pedestrian friendly and its residents more physically active and healthy. IPA has prepared a Walkability Assessment Tool that provides municipalities with guidelines for evaluating walkability and considering strategies to improve local pedestrian networks. 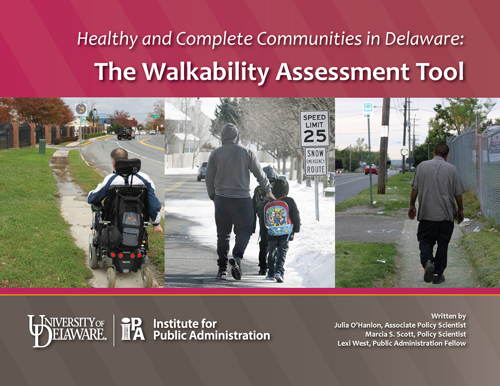 For more information, visit the Walkability Assessment Tool section of the Toolbox or download Healthy and Complete Communities in Delaware: The Walkability Assessment Tool.